It’s a way of ensuring that the assets (money, property, shares or valuables) that you need now will eventually be used to help the Sydney Eye Hospital Foundation save sight. It’s something that you can arrange in addition to – or instead of – giving cash right now. By making a Bequest, you will be in good company. Bequests from donors, like Neville G who has provided $600,000 towards the equipment for the new Bicentennial Clinic that opened in 2013, has made a significant difference to our patient outcomes, with the ability to make earlier diagnoses with state of the art equipment. Bequests are a major source of income that helps the Foundation provide much needed research and advanced equipment to help in the diagnosis of Macular and Corneal diseases. The main advantage of the Bequest system is that it allows donors of all means to make a valuable donation to the Foundation in the knowledge that their generosity will help save the sight of thousands of adults and children who come to the Hospital for help each day. 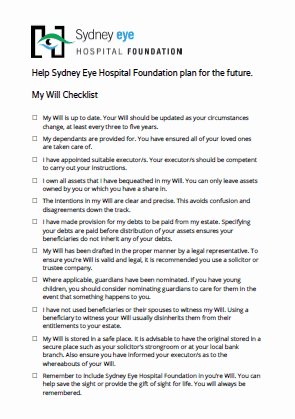 Should you decide to make a Bequest to Sydney Eye Hospital Foundation, clear instructions in your Will are necessary to ensure your wishes are carried out. You can read more about making a Bequest below. He will be pleased to assist. What Happens to Those Who Die Without a Will? Over half the people who died in Australia last year had not written a Will. Their assets were distributed by the Government according to the laws of the State and not necessarily according to their wishes. Some people whom they didn’t want to inherit did, and others to whom they wanted to leave a legacy, did not receive it. Some otherwise responsible people do not make a Will because they think they need to be wealthy to have a Will. Or they believe that if their spouse has a Will, they do not need one (even though half the family assets may be theirs). Some people do not want to think about the possibility of their own death and hence do not want to think about dividing up their assets. We all know that an accident or illness can occur to anyone at any time. Everyone who owns material goods (and we all do) or has family responsibilities should make a Will. The cost can be little or even nothing. It is the only way to insure that your wishes about your assets will be carried out. When you put things in order for the ones you love, and perhaps have provided for the values and charitable work you believe in and support, you know, you have done the right thing. You will be rewarded by peace of mind. Some of the people you wish to remember (for instance, friends and relations, The Sydney Eye Hospital Foundation or other charities) can inherit from you only if you mention them in your Will. You may select the person you would like to take over the responsibility for raising your children or caring for someone for whom you are providing care. This responsibility is known as guardianship and your wishes in this matter can be specified in your Will. Without a Will your assets might be split arbitrarily between your spouse and others, whereas you might want them all to go to your spouse. If your closest relatives are cousins, they cannot inherit unless they are in your Will. Without a Will all your assets would therefore revert to the Government. Having a Will can eliminate a great deal of worry (and often a great deal of legal expense) to your family. Your solicitor, or a trustee company can prepare a Will which includes provisions for the future. This advice is often quite inexpensive compared to the costs of not having your wishes carried out. In the absence of a Will, the State laws determine who will inherit your assets. This is known as The Ladder of Inheritance. Spouse or defacto spouse receives the first $350,000 plus one half the balance of the estate. The other half is shared between any children. You can make minor changes or additions to your current Will. This is known as a Codicil. Your solicitor will help you implement this change. For the Codicil to be effective, it must be signed and witnessed. This is the simplest way of including a charity in your current will. Please don’t try to do it yourself. Having a simple Will prepared professionally is usually quite inexpensive. If you plan to leave a bequest to the Sydney Eye Hospital Foundation, the Foundation can put you in touch with an Honorary Solicitor who will draft a simple Will without charge. Or if you already have a family solicitor, go to that person. If not, find a solicitor or trustee company to help you. Some trustee companies do not charge for writing a Will if they are designated as Executor. After your Will is written according to your instructions, you will have a chance to read it carefully and ask any questions you might have. It is important that you fully understand it so you know your wishes will be followed out before you sign it. It will need to be witnessed by two people who are not beneficiaries. These can usually be supplied by the solicitor who helps prepare you Will. Before you go to have your Will written, decide whom you wish to benefit and to what extent. After you provide for your family, you might want to consider charities and other organisations. If you gather the correct names and addresses beforehand, it will be easier for your solicitor or trustee company to prepare your Will. In addition to specific bequest amounts, you may wish to divide the residue of the estate after all bequests have been taken care of. This residue may grow over time, hence it can be important. Some people choose to support a favourite charity by using the residue of their estate. An Executor is the person who will be responsible for seeing that your wishes are carried out. This can be a family member or a friend. Your Executor can also be a beneficiary in your Will. You can even appoint two Executors or successor Executors in case your first nominee is not able to carry out the duties when the time comes to act. If you care for minor children, or care for a family member who cannot function without help, you will need to appoint a Guardian and consider putting funds in Trust to help with that care. Arrange to Keep your Will Safe and Secure. Many people entrust their Will to the Solicitor or trustee company who helped to draft it. Your bank manager, also, will keep it secure. If you keep it yourself, make sure your named Executor knows where it is and how to retrieve it. Your Will should be reviewed at least every five years or sooner if family circumstances change. What Duties are Executor/s required to do? To arrange for the funeral and burial details. To make sure all assets are safe and secure. To ascertain assets and liabilities and prepare a proper list of same. To obtain a grant of Probate. (This is the legal procedure which establishes whether or not you left a valid Will). To verify the correct beneficiaries. To collect the assets and transmit them to executor/s name/s. To prepare all appropriate tax returns. To advertise for claims against the estate. To sell those items which are to be sold and to insure that a proper price is obtained. To defend any claims against the estate. To make sure that all moneys are invested until distributed. To liaise with all beneficiaries. A professional organisation (such as a solicitor or trustee company) will charge a fee for being an executor. A friend or family member may waive such fees. How do I Value My Estate – what have I got to leave? To determine the value of your Estate, a first step is to add up the items that make up your estate. The Sydney Eye Hospital Foundation has a free booklet called “Register of Information” which will help you to make this task easier. You can send for this special booklet through the coupon on the last page. Add up the value of the things you own – you may need some professional help here. Your property, (home, car, furniture, collections etc.) your savings, your pension and annuities. Subtract what you owe in the way of mortgages or debts. The net amount is your estate. You may be pleasantly surprised at the total. It is therefore important that you decide its distribution. You can give a specific amount of money to the Sydney Eye Hospital Foundation. This does not allow for change in your circumstances or for inflation, which will tend to erode the value of a specific amount. You can make a bequest to the Sydney Eye Hospital Foundation to take effect after the death of your spouse. Your spouse would have your estate for as long as he or she lived, then the indicated portion would revert to the Sydney Eye Hospital Foundation. You can provide a percentage of your estate for the Sydney Eye Hospital Foundation. If your estate grows or is depleted by inflation or unforeseen circumstances, your family and friends or other beneficiaries will therefore not be disadvantaged. You can leave the Sydney Eye Hospital Foundation a particular item or items – such as shares, paintings, property, jewellery or other items of value in your Will. You can make a bequest to the Sydney Eye Hospital Foundation through a perpetual trust that will provide ongoing financial support. You can take out a life insurance policy on your life or on the life of another nominated person, with the Sydney Eye Hospital Foundation nominated as the sole beneficiary. Or you can change the name of a beneficiary who is no longer appropriate, to that of the Sydney Eye Hospital Foundation. No matter what type of bequest you make, please be assured that it will be used to help Sydney Eye Hospital. It will be appreciated and you will be appreciated. An ADMINISTRATOR is someone who is appointed by law to settle your affairs if you die without leaving a Will, if your Will is not valid, or if the named Executor does not act. ADMINISTRATION EXPENSES are those costs incurred in the administration of the estate or in the collection of the assets, payments of debts and distribution of property. Assets are all the items you own – property, vehicles, bank accounts, shares, household goods, jewellery and so on. Together, these are known as your Estate. A BENEFICIARY is someone who is to receive something from your Will. A BEQUEST is a completed gift transfer, by Will, of personal property such as cash, securities, or other tangible property. A CODICIL is a charge or an addition which you can make to your Will. A DEFERRED GIFT is a gift that is made now, but is not actually received until sometime in the future, usually after your death. A DIVORCE will revoke that portion of the Will in favour of your former spouse. It is important to consider whether you should make a new Will if you are divorced. An ESTATE is the total of assets – (property, possessions and money) – that you leave when you die. An EXECUTOR is someone you appoint in your Will to see that your wishes and instructions are carried out after your death. A GUARDIAN is the person or institution you appoint who will take on the responsibility of raising your minor children or caring for someone for whom you are providing care or legal protection, should you die before they are in a position to care for themselves. A Guardian may also be appointed to take care of your own non-financial affairs if you are unable to act for yourself through illness or dementia. INHERITANCE is the process by which your possessions are passed on to your family after your death. INTESTATE OR INTESTACY means dying without making a valid Will. A LEGACY is a gift left in a Will. There are three common kinds of legacies. A specific legacy which is a definite property or object; a pecuniary legacy which is a gift or a specific sum of money; and a residuary legacy which is a gift of money or assets left over when other legacies and expenses have been paid. MARRIAGE will revoke any Will you have previously made. It is important to make a new Will when you marry. You can make a Will in anticipation of marriage. PARTIAL INTESTACY is the name for a situation which arises when someone’s Will does not dispose of the whole of the estate. PROBATE (from the word “to prove”) is the legal procedure to establish whether you left a valid Will. If not, an Administrator is appointed to distribute according to law. RESIDUE is the amount of money left over when all the expenses and the specific legacies have been paid from your estate. Many people choose to leave the residue, or a share of it, to charity. A TESTATOR (or TESTATRIX) is a person who has made a Will. A TRUST is an arrangement you can make in your Will to administer part of your assets after your death, e.g. on behalf of your children if they are still minors. A WILL is a written instrument by which a person disposes of his property on death but which may not be effective unless executed in accordance with correct legal procedures. If you have named the Sydney Eye Hospital Foundation in your Will you are under no obligation to inform us of your decision. However, if you do let us know your intentions it may help us understand your wishes and thank you personally. Your future support is extremely valuable to us and we would like to thank you personally for your gift. To assist the Foundation, your answers to the following questions would be appreciated. Sydney Eye Hospital Foundation, GPO Box 1614, Sydney NSW 2001. Please be assured that we will respect your privacy and that all information will be treated in the strictest confidence.